As a general rule, third parties may not use the RStudio® logo (“logo”). On this page are the limited circumstances under which third parties may use the RStudio logo. The logo must always be used pursuant to the specifications on this page to identify RStudio, or RStudio products or services. Any use that falls outside of these specifications is strictly prohibited. When displaying the RStudio logo, please follow our standard Trademark Guidelines. These guidelines are designed to help you use our brand and assets, including our logo, content and trademarks without having to negotiate legal agreements for each use. To make any use of our marks in a way that is not covered by these guidelines, please contact us at info at rstudio.com and include a visual mockup of intended use. ­In advertising, marketing collateral, or a website that references your connection with RStudio (for example, the material states that you are a referral partner, training partner, or consulting partner) provided that the area in which the RStudio logo is used includes the corporate logo of at least 1 other company with which you have a similar relationship. ­In an area of a website, advertising, or marketing collateral exclusively dedicated to the sale of RStudio products, and in such a manner that associates licensed RStudio software with the RStudio logo. Use the positive version on light or white backgrounds. The full-color reverse logo may be used on dark color backgrounds, as well as dark areas within photographs. ­The logo is accompanied by the registered trademark symbol (®). ­­The Blue Ball may not be separated from the logotype. ­­A one color logo is only acceptable when media reproduction is limited. In these cases, the logo may be reversed to white on a background that provides suitable contrast. A dark logo is allowed when media reproduction is dark only. To properly stage the logo, a minimum clearance between the logo and other elements must be maintained. The cap height of the R in the logo indicates the measurement of minimum clearance between the logo and other elements on all sides of the Logo. The logo may not be used in any manner that might imply that any non-RStudio materials, including but not limited to goods, services, websites, or publications are sponsored, endorsed, licensed by, or affiliated with RStudio. The logo may not be displayed as a primary or prominent feature on any non-RStudio materials. Companies using the logo pursuant to these guidelines must also display in the primary and more prominent position, their own logo(s), business name, product names, or other branding. The logo may not be used in a manner that would disparage RStudio or its products or services. The attribution clause “RStudio is a trademark of RStudio, Inc.” must accompany use of the logo. Neither the logo nor the RStudio name may be used in any other company name, product name, service name, domain name, website title, publication title, or the like. Non-RStudio materials should not mimic any RStudio advertising, product packaging, or website design. The logo must be used as provided by RStudio with no changes, including but not limited to changes in the color, proportion, or design, or removal of any words or artwork. The logo may not be animated, morphed, or otherwise distorted in perspective or appearance. The logo must stand alone and may not be combined with any other object, including but not limited to other logos, words, graphics, photos, slogans, numbers, design features, or symbols. The logo must never be used to represent the word “RStudio” in text, including in a headline, product-name logotype, or body copy. The logo must not be incorporated or used in any manner as part of, or in close proximity to another company’s name, domain name, product or service name, logo, trade dress, design, slogan, or other trademarks. The logo must never appear with any other symbol or icon; contained within a box, circle, or other shape; or combined with any other name, logo, or icon to create a co-branded logo. Words don’t just hold meaning; they communicate by their very form. We primarily use the Source Sans Pro font family: elegant and direct, stylish but not exclusive. RStudio reserves the right in its sole discretion to terminate or modify permission to display the logo, and may request that third parties modify or delete any use of the logo that, in RStudio’s sole judgment, does not comply with these guidelines, or might otherwise impair RStudio’s rights in the logo. RStudio further reserves the right to object to unfair uses or misuses of its trademarks or other violations of applicable law. Right-click the file type you’d like under the logo to save locally. 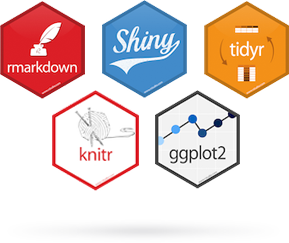 All of our R Package hex designs are available at Github.